Unlike most offshore racing teams, which tend to have single owners who answer to no one, the Miss GEICO campaign is literally run by committee. The Scotts (Begovich and Colton), the Garys (Goodell and Stray) and Marc Granet (there is only one Marc Granet) are equal partners in the team. They don’t have to agree on all decisions, but they do have to make them as a group. The only entity that can overrule the group is its sponsor, of course. 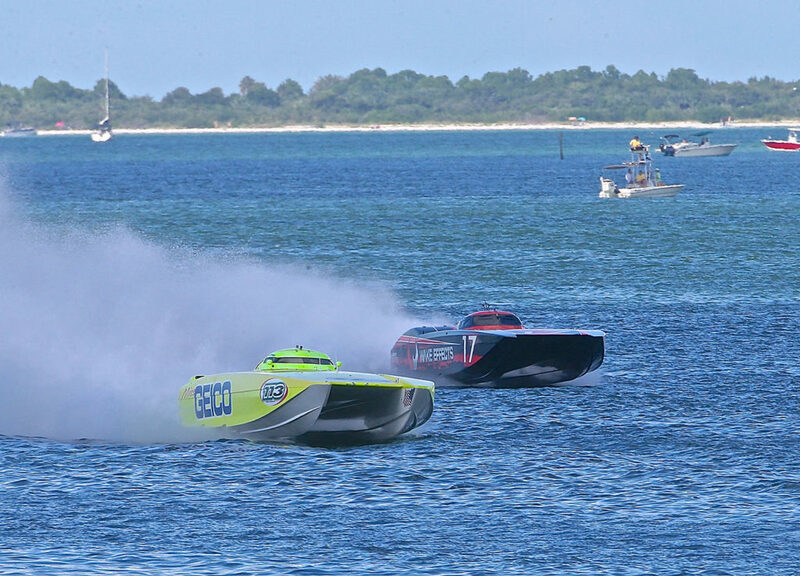 And that means, as previously reported in March on speedonthewater.com, the Miss GEICO team will not compete at next month’s Super Boat International World Championships in Key West, Fla. Done for the 2018 SBI season with a national title to its credit, the Miss GEICO team is eager to take on the competition at the OPA Worlds next month. Photo by Pete Boden/Shoot 2 Thrill Pix. “For us, this is about winning races but for our sponsor it’s about selling insurance,” said Stray, who manages the team. “And they are paying the bills. So last weekend’s national championship-winning performance was the end of the 2018 SBI season for the Miss GEICO team, which will head to the OPA Worlds in November. And while there may be some disappointment among members of the team, which claimed an SBI Superboat Unlimited-class world title with Steve Curtis and James Sheppard in the cockpit of their 44-foot catamaran, the overall mood of the group is upbeat. That makes perfect sense after a few deeply disappointing years prior to the 2017 season. Curtis, who will run a Victory team boat at the SBI Key West Worlds, said he’s enjoyed throttling the Miss GEICO cat and is looking forward to getting back in it. “Rusty Rahm is a great driver and Jeff Harris is a great throttleman, and they really pushed us in the SBI races,” he added. Save for a torn Achilles tendon he recently picked up playing soccer, Stray said he has nothing to complain about. Nor do the other members of the Miss GEICO owners group or their dedicated crew. Their patience and persistence has paid off.